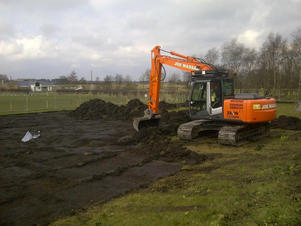 Rainford Tennis Club are delighted to announce that work has begun today on our new tennis courts at the Jubilee Recreation Ground. The work, which is being carried out by Doe Sports with funding from the LTA and Sport England’s Inspired Facilities, will see three new porous macadam tennis courts built at the Club over the next three months. The additional courts will allow the Club to achieve our aims of increasing participation in tennis for all people from across the St Helens area.